Only antimatter is more expensive than endohedral fullerenes which an Oxford startup just recently sold for $167 million per gram. According to Designer Carbon Materials – the only company in the world that manufactures this exotic material – it sold 200 micrograms of pure endohedral fullerenes for $33,400. 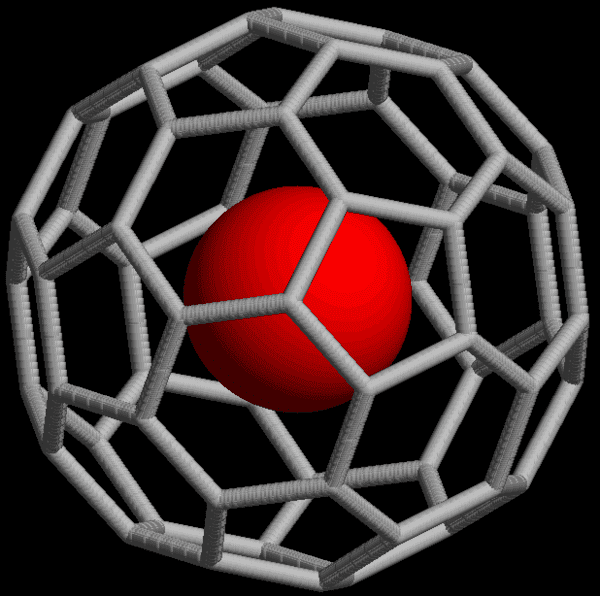 Endohedral fullerenes is basically a nitrogen atom encased by 60 carbon atoms. These carbon cages are called buckminsterfullerene and resemble the vertices on a football, which is why they’re also known as buckyballs. Buckyballs could not exist without carbon’s versatility. Carbon is the most versatile element, allowing carbon molecules to take on many forms, or allotropes. Molecules consist of multiple atoms chemically bonded together. These atoms can be different elements, as with water (H2O), but they do not have to be, as with oxygen (O2). Though, molecules with only one element are not restricted to just one shape. For example, oxygen can also form ozone (O3), which has a different shape than O2. Oxygen, in its O2 shape, is said to be a different “allotrope” to oxygen as ozone, in its O3 shape. Oxygen also has two other allotropes – O4 and O8 – that are a lot stranger, but far less common. Diamond – the most loved carbon allotrope – exists in a lattice shape with carbon molecules bonded at tetrahedral angles. Graphite – commonly found in pencil lead – exists as sheets or layers of hexagon tessellations stacked and bonded together. Graphene – which ZME Science frequently writes about for its many groundbreaking properties – exists as just one single sheet of graphite. Graphene also plays a role as an intermediate step in forming buckyballs in space. Fullerenes exist as a variety of “3-D shapes.” Fullerenes with 60 carbon molecules are one form of C60. These 60 molecules can be arranged as 20 hexagons interspersed with 12 pentagons. Can you picture that? This is exactly the same shape as a normal soccer ball, except that fullerenes are hollow and not manufactured by Adidas. To make a molecule with 60 carbon atoms, you need to start with at least 60 carbon atoms. There are two possible ways to get 60 of these atoms. (1) As one option, you can start with a bunch of smaller molecules that each have a few carbon atoms and then combine them together. (2) Or as an alternative, you can start with a larger molecule with at least 60 carbon atoms and then break it apart. Fullerenes molecules have extraordinary electrical properties. What makes the nitrogen variety so special (and ludicrous expensive), however, is a long electron spin lifetime. This makes them perfect for atomic clocks – an extremely accurate type of clock which is regulated by the vibrations of an atomic or molecular system. The auto industry is particularly interested in atomic clocks since these can be used to jump GPS accuracy to the millimeter range, which is essential if selfdriving cars are ever to become widespread and, most importantly, safe. “Every mobile phone could one day contain one of these things,” Mr Cary claimed.